A common motivation teenagers give is that non-suicidal self-harm provides a way to escape unpleasant thoughts and emotions. Another motive, little explored before now, is that self-harm is a way to deliberately provoke a particular desired feeling or sensation. Escape and seek. Escape pain, seek resolution. Pain because adolescents that self-harm are, to simplify, experiencing existential suffering or depressivity and eagerly looking for ways to cope with it. One of those ways is the downward spiral of depressivity, which revalidates the main causes of depression - this leads to the annulation of the self; the other, is to seek an alternative to the pain that one is feeling, which is, more often than not, hardly meaningful, or impossible to signify - this leads to creative destruction through meaning-making processes. The most common sensation the teenagers sought was "satisfaction" (45 per cent of them), followed by "stimulation" (31 per cent) and "pain" (24 per cent). Excruciating pain, psychological pain, can take many routes in order to be materialised and addressed but I question the meaning of satisfaction that it is attributed to this word. I believe that what is tried to symbolise here is the abject need to seek closure, to diminish activation, to give a sense of control to the experience of existential suffering. To seek pain is not in contradiction with seeking satisfaction or stimulation; they seem to be expressions of an experience of pain in the spectrum of making sense of the same pain. Different avenues to signify different aspects of this process of questioning the fabric of which one is made of. The meaningful construction of personal sense in the scope of one's identity in the maze of depressivity. This is quite interesting. The experiencing of self-harm is, no question about it, intrinsic to its author, the individual. So, in that sense, the aggregation of meaning in categories proves to be less than ideal. For instance, one explanation for the more frequent self-harming observed among those who say they self-harm because they want to experience pain, is that the act triggers pain-relief mechanisms in the brain - a form of euphoria. And yet, self-harming was less frequent among those who said they self-harmed for satisfaction. This is why. Contradictions emerge rapidly if the words are used to capture so powerful experiences without consolidating first the narrative constructions and experiential expressions of self-harm in the intersections of the basics of the pain that is experienced. 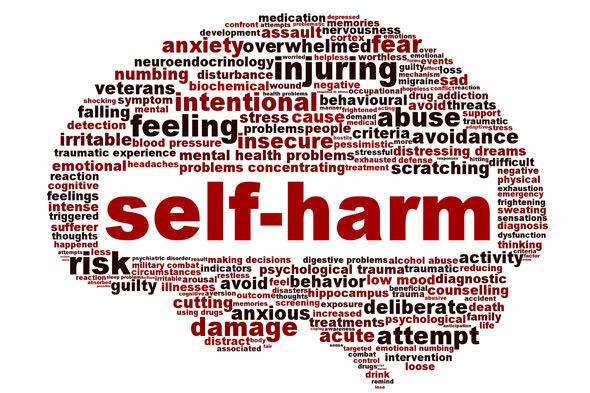 Lastly, self-harm is tool, instrument, is expression, is an apparatus of the self to symbolise the need to create...destroying. But it is not the cause that leads to its reinforcement. It isn't cause and consequence but it can further aggravate the main issue, the ontological basic insecurity of the self. As with the general population, some of us have specific capacities and abilities to perform in certain areas, whereas others focus their energy and deliver their abilities in different outcomes. This relates to the fact - obvious to everyone - that although we share a common human genome, our differences are very significant. Even identical twins are not bounded to have ASD, as there is a 20% chance that one doesn't have it. 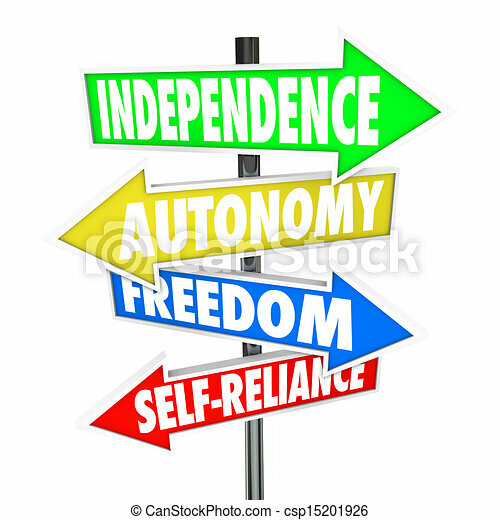 This leads to the fact that independence is crucial for us to travel our own paths and for some that is easier said than done. Think for a minute about the adolescent with severe social anxiety or that mother that has to care for her children on her own, without any help. Reality can be a very harsh experience. It seems that for individuals with Autism, now Autism Spectrum Disorder (ASD), superior visual thinking is proving to be a very big help for high schoolers to achieve and improve their levels of independence. "It's clear that teaching independence to students with autism should be a central focus of their activities in high school." This is of paramount importance because individuals with ASD have a very carved inability to communicate and interact according our socially defined, agreed and learned behaviours. It is like they have failed to learn the same social vocabulary that we did, although I would prefer to put it as an inability to function in the same level of meaning-making that is agreed in determined social contexts. "When an adolescent with ASD has a pen that runs out of ink, that student may be more likely to wait for prompting from the teacher before asking for a new pen or just finding a new one,"
Given the literal understanding of relations, social interactions and communications, visual schedules can help students to reach higher levels of autonomy by bypassing the need to be prompted by others to act volitionally. The same could be said about Technology - the example of Microsoft's OneNote or Google Drive in schools could bring some interesting analysis. "Visual schedules, for instance, allow students with ASD to act independently, because they don't involve verbal prompting from teachers," Hume said. "Visual information that explains what to do also can be useful in home, school, and employment settings, because it eliminates the need for continual monitoring and support." At the end of the day, for educators, it isn't so much different of adjusting techniques according to the unique individual. Interventions for children are often focused on educational and behavioural strategies. Here is the case of Pivotal Response Training, that focus on motivating the child to improve their skills in social communication and interaction. We all know that infants have incredible capabilities. For instance, we know that a big percentage of babies emit their first words or meaningful combinations of words around the age of 18 months. However, there is more to babies' abilities than just words, we all know that. A study addressed at the BPS Research Digest brings up an interesting but puzzling research study, that I haven't quite been able to put together. This article focus on the topic of memory formed by babies on moment A and their retrieval on moment B. This conclusion puzzles me. Shouldn't children look at the researcher that they had met two years before, as if they were identifying familiarity in the process of memory retrieval? Why is that looking at the unfamiliar researcher makes the case for the conclusion that the babies had memory of the researcher two years before and therefore were drawn to the unfamiliar researcher? I believe there is something missing in this puzzle. How Much Do Parents Determine Their Children’s Success? parents put too much on their short-run comfort and too little on long-run satisfaction. I think the author completely fails to address that the self-other patterns of functioning are tremendously important variables that determine the impact that parents have on their children. Just think for a minute on the cases where parents have anxiogenic patterns of functioning with their children and how that can impact their self-development; or, on the other extreme, parents that teach principles in a robust manner, where the child feels empowered by a vicarious experience that makes sense. There is so much to this discussion that the points addressed just feel short of enlightening the questions that they are supposed to answer. A great article on Boston Globe raises the question of delivering the right resources to those who are commonly labeled as gifted, challenging the general assumption that that population already has the Nature in its favor and that they don't need anything else. On the other had, in addressing this issue, it should be made clear that without continuing to pursue the lower end of spectrum, the system leads to deeper inequality. Therefore, the question to be discussed here is the one of exploring and stimulating the potential of every student according to his own contextual factors. It is only through this route that the top will become larger and bottom will become smaller.